Does anyone have any of the new bird ones to trade with me for any of the others? I didn't get a chance to get those. I have seen those on ebay.Aren't they fake? If not which belongs to whom? They're genuine, they're both Pat's. He's so special he gets two different kinds. And sorry Emily, I did have spares but have already given them all away. I'll have to keep an eye out on eBay for some that don't go for silly prices! All the Picks on ebay are going for crazy prices. But I'll keep my eyes open for you Emily. BTW Your not alone. I didn't any of Pat's picks either. Thanks. sounds like I should have asked Lara sooner! I would have asked Ruff for them but I forgot/didn't get the chance. I tried so hard to get picks on the last two Australian tours but no luck. Does anyone have any spares they will sell or trade for other stuff? I'd really like to have some of Nate's the most, I guess. Please send me a PM if you can help me out. I'll be happy forever. All Nate, all the time. 2011-12-02 | 2011-12-03 | 2011-12-05 | 2011-12-08 | 2011-12-10 - The best week of my life. I went to a show a few years ago and I have 7 or 8 picks from the show. They threw them out after the show was over. I tried to get a red solo cup that Dave drank out of but the stage hand wouldn't give it to me haha. Learn to FLY? Flying is simple. You just throw yourself at the ground and miss. 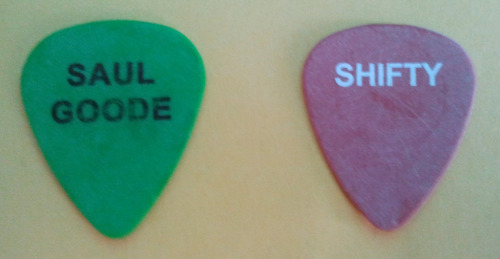 Back in October when I saw them, Shifty's pick hit my hand, but my mom bumped into me, causing me to drop it. I got down as fast as i could to pick it up, but as soon as i touched it again, some guys grabbed it from me. At least I can say I touched it though. This is one of the bird picks. Anyone have an extra? I finally got a couple of picks. This is on eBay at the moment. It says it's Shifty's pick. I call shenannigans. Also, I've got a few more picks in my collection but I'd still like some more. If anyone has any doubles they would sell or trade, please send me a PM. I want to get enough to get them mounted and framed. 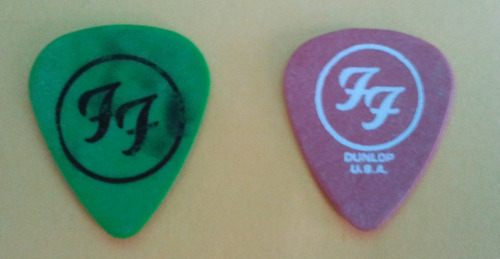 I collect other bands picks too but Foos are my main hobby. Can't say I have ever seen that one.If its any of the bands I would say Nate. Looks like we've got word from Gus that it is from 1999, which I had guessed due to it reminding me of that "Gus" shirt. I've never seen this one before. I believe a friend confirmed with Franz that it was his. Thanks! You learn something new everyday! I asked the seller who's pick it was & he has replied saying its a crew pick, so that could mean crew as in the pick picture is Gus or the guy hasn't a clue! There's one of these on eBay at the moment if you're still looking for one.